AVI (DivX, XviD, etc. ), DV AVI, MP4 (inc. Sony PSP and Apple iPod), WMV, 3GP, 3G2, QuickTime (MOV, QT), SWF, DVD, VOB, VRO,MPG, MPEG 1,2,4, DAT, VCD, SVCD, ASF, MJPEG, H.263, H.264, Real Video (RM, RMVB), DVR-MS. AVS Video Converter is the best on the market today! 2. Cut unwanted parts and TV advertisings from DVDs or video files recorded with PVR, DVR & DVD camcorders. Our scene detection algorithm saves your time by splitting video into episodes. Leave the scenes you need, delete the ones you don’t. with AVS Video Tools integrated burning engine to watch them on your home DVD player with friends and family. Use DVD menu templates. Split your movie into chapters. 4. Convert video files and DVD to DVD, hard drive, Sony PSP, Apple iPod, Archos, Zen Creative or any other portable media player. Video converter supports Memory Stick Video format with thumbnail preview. 5. Convert video content for DVD/MPEG-4 players (with DivX/XviD support) and handled devices like Sony PSP, Apple iPod, Portable Media Player (PMP), and GSM or CDMA mobile phones. Transfer video files via Infrared, Bluetooth or USB cable. 6. Transfer video from DV cams to hard drive, convert video and make movie DVDs. Transfer VHS video recorders to hard drive and DVD. Capture video from TV tuners and WEB cameras. Convert video directly to MPEG 4 and create movie DVDs. 7. Make Flash SWF, Real Video or WMV movies for your web site. Video converter from AVS Video Tools will help you to convert video to small movie files ready to be streamed across the Internet. 8. Use AVS Video Converter to convert video to audio tracks and images. Save audio streams as audio files, extract single frames and save them as image files. 9. Enhance your movies. The only video converter which offers timeline video editing. Convert video & Delete unwanted parts. Split and join video files. Rotate, add titles and credits, apply more than 50 audio and video effects to your movies. 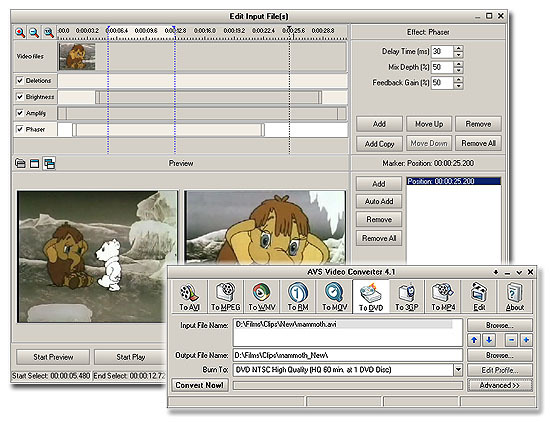 All AVS Video Tools interface: Video Converter, Video ReMaker, DVDtoGo, Capture Wizard and tech-support are available in English, French, German, Spanish and Italian. Convert several video files at once. Merge and split them. Join several video files and make one DVD, use AVS Video Converter. Simple and intuitive interface. The “learning curve” is near zero. Start working from the first launch. It is very easy to convert video and work with AVS Video Converter. We respect your privacy. So there are no spyware and adware in all our software: AVS Video Converter, DVDtoGo, Video ReMaker.